Nearly 1,000 authors affected by the onging e-book spat between Amazon and Hachette have signed their names to a letter —set to run as a full-page advertisement in the Sunday New York Times later this week —imploring the online retailer to settle the dispute and calling on readers to voice their displeasure directly to Amazon CEO Jeff Bezos. 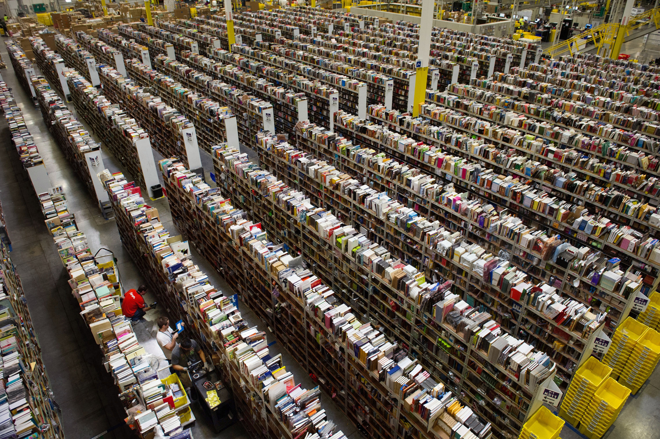 An Amazon warehouse, via The Dallas Morning News. Composed by techno-thriller author Douglas Preston, the missive counts best-selling writers including John Grisham, Stephen King, Malcolm Gladwell, and Nora Roberts as signatories. Its appearance in the New York Times was first reported by that publication. "As writers--most of us not published by Hachette--we feel strongly that no bookseller should block the sale of books or otherwise prevent or discourage customers from ordering or receiving the books they want," the letter reads. "It is not right for Amazon to single out a group of authors, who are not involved in the dispute, for selective retaliation." Amazon stopped accepting pre-orders for new Hachette releases in May, after the publisher refused to grant Amazon more favorable terms for the sale of e-books. The retail giant then began to draw down inventory of print editions, increasing the tiff's impact on authors' income and sparking a contentious public battle. Facing growing backlash, Amazon extended an olive branch to authors last month. The company proposed a temporary arrangement in which sales would resume, but profits would be given directly to the writers, cutting Hachette out of the loop until a new agreement was reached. That proposal was roundly criticized by authors, including Preston, who said that such a deal would only serve to weaken Hachette. Amazon is embroiled in similar battles with a number of smaller publishers, where it is said to be "increasingly ruthless" as it renegotiates terms. The company has seemingly been emboldened by last year's U.S. court decision that saw Apple, Amazon's only major rival in the e-books market, found guilty of antitrust violations over its own agreements with publishers.